Counting down to exams lo!! Apr 27 & 28....my last 2 papers for Diploma~~!! 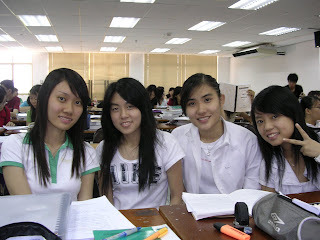 This is the last week of my studies in penang tarc...itz kinda unbelievable that 2 years passes by so fast... Tomorrow is gonna be my last day attending class here lo... Actually i wanted to see some of my lecturers who have taught me before to thank them personally(not like me huh..) but...I am just too laid back to have the guts to do so....=.= Everyone of them are great, dedicated, responsible...and I can't deny that they gave me a lot of confidence and strength to bring out the best in me these 2 years... Thank ya all soooo much!! Keep up the good work! No more time to relax anymore...need to maintain my results for this last 2 subjects...!